By now, you may be getting tired of all that resolution talk. We get it! But hear us out on this one. You know veggies are important, and you know they'll help you achieve other goals, like weight loss, healthier lifestyle, clearer skin... so why not resolve to eat more of them? Let's be real; you can never have enough vegetables! So, now that we've resolved, together, to eat more veggies, how do we go about it? Salsa has to be the easiest and tastiest way to get more veggies at just about any meal. The versatility means you can pile it on just about anything from chicken, fish and eggs, to toast, rice or a salad bowl. You can also customize the salsa based on just about any flavor profile. Like this strawberry pepper salsa. Sometimes (or if you're like me, all the time) you just crave a big old BLT or taco, but maybe carboloading isn't on your agenda. 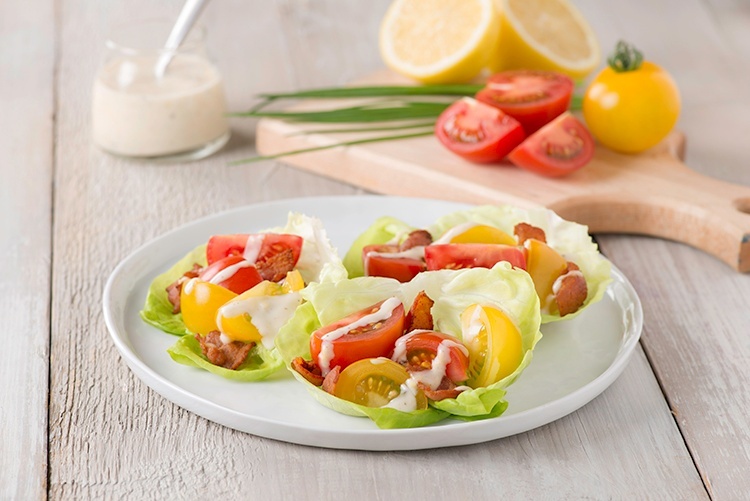 Behold, the BLT lettuce cup. Versatile, tasty, and the cutest little pocket of veggies. Why not fill one with that salsa I just told you to make? Or this one? Or maybe this one here? Endless possibilities, people. I'll let you in on one of my kitchen hacks. After throwing away a big bag of wilted spinach one too many times(it was purchased with the purest intentions), I thought surely there must be a way. And there is. These days, I blend a big batch of spinach or kale with almond milk (you can use whatever liquid you prefer). 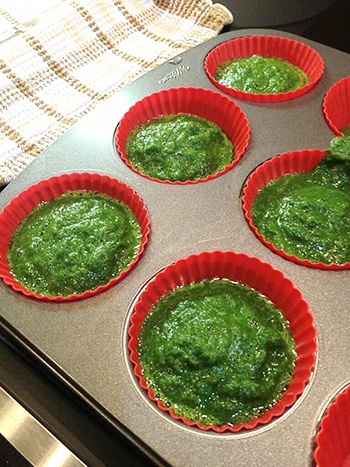 Once liquefied, pour into a muffin tin and freeze. My hack's hack is to use reusable silicone muffin liners, so you don't have to deal with a frozen paper-y mess, or trying to scoop it out of a frozen pan. Next time you're making a smoothie, pop a little puck in for extra veggie goodness! As a self-professed carb-o-holic, I admit this one is hard, but if I can do it then you definitely can! Mashed cauliflower instead of mashed potatoes is, in fact, delicious, and spaghetti squash is a great healthy alternative to pasta. Be sure to have a delicious, flavorful veggie sauce to go with that one- like our chunky Minzano™ tomato sauce. We're not all morning people, so breakfast can be tricky, but it's incredibly easy to get some veggies in. Avocado and tomato toast is quick, easy and so delicious. Or try scrambling an egg with diced tomato or pepper. 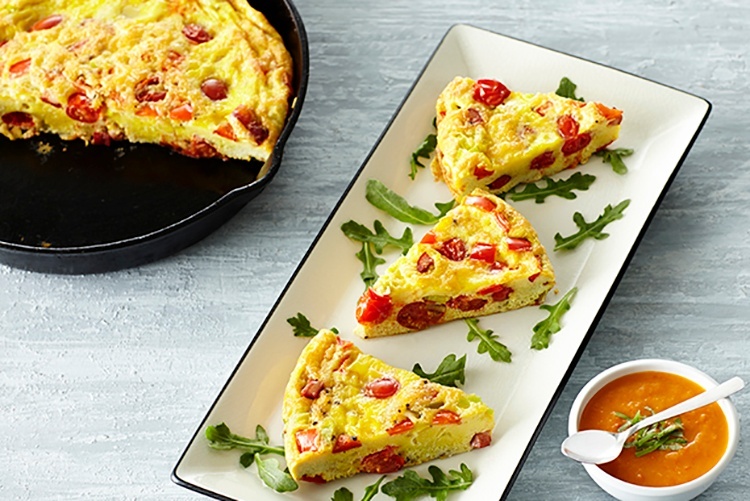 On weekends, breakfast burritos or a delicious frittata are perfect ways to add some more veggies to your diet. Veggies make the perfect snack. I constantly nosh on One Sweet® tomatoes all afternoon to satisfy my sweet tooth- not to mention one serving contains 60% of your daily recommended intake of Vitamin C. Combine that with a sliced bell pepper, which has 180% Vitamin C and you've got yourself a flavorful 1-2 punch. Goodbye winter cold!